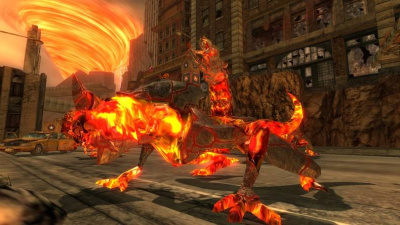 Iblis monsters in the fiery future of Crisis City. Iblis monsters are supernatural fire-beasts which serve as opponents in Sonic the Hedgehog (2006) for the Xbox 360 and PS3. Conjured into being by the hyperdimensional powers of Iblis, these creatures are found anywhere that the Flames of Disaster hold sway. Iblis' creations are composed of glowing lava or fire, and come in a variety of flavours. The most common are four-legged, lizard-like creatures (pictured), which shuffle around on the ground and vomit gouts of flame at passing heroes. Other monsters include burrowing worms with triple mandibles that hurl volcanic bombs; flying fire-hawks which can lob energy spheres; and towering humanoid collosi that can take (and deal) a lot of punishment. While they are chiefly associated with Iblis, the other component consciousness of Solaris, Mephiles the Dark, also summons the creatures forth to thwart his pursuers in Shadow's Wave Ocean stage. Tougher versions of the Iblis monsters crop up in later levels (or harder modes) of Sonic '06, which match Mephiles' colour scheme more than Iblis': purple-black rather than red-brown. Biter and Stalker, lizard-like creatures. Golem and Titan, humanoid creatures. This page was last edited on 7 September 2015, at 13:48.